DURHAM, NC - The Durham Bulls Athletic Park will host three postgame fireworks shows as part of its Independence Week celebration. The USA Baseball Prospect Classic kicks off the festivities on Tuesday, July 3, with NC State star Carlos Rodon scheduled to take the mound. The Norfolk Tides then visit the DBAP for a two game series against the Durham Bulls with games on Wednesday, July 4th and Thursday, July 5th. Fireworks will follow all three games. The final game of the USA Baseball Prospect Classic takes place at the DBAP on Tuesday, July 3rd and will be followed by the first of three fireworks shows this week. The 6:05pm matchup of the Nation's top amateur talent will feature rosters that mix members of the Collegiate National and 18U National Teams. NC State pitcher Carlos Rodon is slated to start the game and throw four innings. Rodon was the only freshman named to Baseball America's All-America first team this season, finishing the year with a 9-0 record and 1.57 ERA. The Holly Springs, NC native struck out 135 batters in 16 starts en route to an NCAA Super Regionals trip with the Wolfpack. 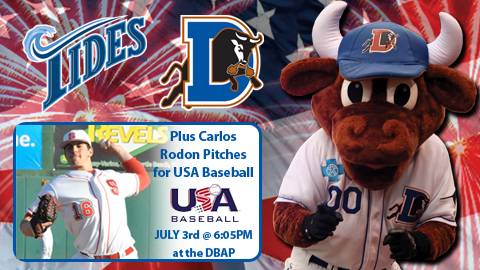 On Wednesday, July 4th the Durham Bulls welcome the division rival Norfolk Tides for a two game series. Immediately following the 6:05pm game on the 4th of July, the Bulls will host the City of Durham's official Independence Day Fireworks Extravaganza, the most dazzling pyrotechnics spectacular in the region. Wrapping up Independence Week on Thursday, July 5th, the Bulls close out the short homestand with a 7:05pm game against the Baltimore Orioles' top affiliate. Fans can take advantage of $1 concession items, including Bright Leaf hot dogs, popcorn and fries during the game. Thursday is also College Night, where students can get a Terrace View ticket and $5 in Bulls Bucks for just $10 or an Outfield Reserved ticket for only $4.99 by entering the promo code COLLEGE when purchasing tickets online at durhambulls.com. Once again, fireworks will follow the game. Tickets for Independence Week games at the DBAP are on sale now, but very limited. Tickets for all Bulls regular season home games and the 2012 Gildan Triple-A National Championship Game are available online at durhambulls.com, by phone at 919.956.BULL, or in person at the DBAP ticket office.